Before the scouting combine and the heart condition that forced Star Lotulelei to sit out and go for additional testing, I had him as the runaway top prospect and number 1 pick to KC. Even though he has been cleared by doctors, it has still scared teams away enough to drop him down. The Chiefs have a solid LT with Brandon Albert, so Joeckel would fit in as the RT for this year after releasing Eric Winston, but will be the starting LT either this year or next. The Chiefs have been speaking to the Dolphins about trading Albert for a second round pick, who is playing on a franchise tender. Joeckel will be the pick here. In my opinion, the most dominant and disruptive defensive player available in this year’s draft, Jordan is an edge rusher at 6’6” 250 lbs who clocked a 4.60 40-time at the combine. The Jaguars have a new coach who learned under Pete Carroll in Seattle that speed builds defenses (hence Bruce Irvin 15th overall last year). Jordan can absolutely fly and is an impact player from day 1. Another dominant defensive player in this years draft, can play anywhere on the defensive line, 1 technique, 3 technique, and 5 technique. Big body with speed, Floyd would fit in the Oakland defensive line immediately with the losses of Richard Seymour and Tommy Kelly. The Raiders need to generate a pass rush, and Floyd can fill that void for them. The Eagles cannot afford to NOT find an impact tackle in this draft, as their line is in shambles following the torn Achilles to Jason Peters, the release of Demetress Bell, and the loss of King Dunlap to San Diego. There is talk that it is a coin-toss for Kansas City to take either Joeckel or Fisher, with many believing that Fisher has more upside, but either way one of the two will be here and the Eagles will sit back and take whichever falls to them, but I believe that the chips (no pun intended) will fall as such. A freak athlete who is raw as he doesn’t have a lot of football experience on his body, he has drawn a lot of comparisons to Jason Pierre-Paul, and if Ansah can match that productivity or increase on it, the Lions will be getting a true player. He is high risk/high reward as Ansah does not have much football experience, but I think with proper coaching he can be a great player. The first surprise of the draft drops right here! As the draft nears, Eifert has continuously gained steam from many teams around the league, and I think this is the spot that looks good for him. This may not be the team that takes him, but if its not Cleveland, it will be Atlanta trading up to snag him here. Atlanta and Cleveland have a history of draft-day dealing (see: Julio Jones) and with Tony Gonzalez seemingly on his way out, Eifert would be an over-the-middle fearless Tight End for the next 15 years. If not Atlanta, he would still be a great fit for Cleveland and give Weeden another target that he desperately needs. This pick was a toss up between Lotulelei and Lane Johnson, but with many needs I believe Arizona takes the best player available, and I would have to assume that Lotulelei is higher on their big board than Johnson. Lotulelei was the top prospect all season long coming into the draft until the medical snafu at the combine that caused him to be sent home for additional testing on his heart before being medically cleared. His draft stock has not recovered and other players have leap-frogged him. Lane Johnson caught steam because of his athleticism, but Lotulelei has to be the pick here. And the first quarterback off the board is Gen…wait what? Ryan Nassib? That’s right. The 8th spot has been quarterbacks the past 2 years (2011 – Jake Locker, 2012 – Ryan Tannehill) and I believe the trend will continue here. The Bills have a new head coach in Doug Marrone whose last job was manning the sidelines at Syracuse, and clearly the team is happy with him in this spot. A competition in camp between Tavaris Jackson and Kevin Kolb also likely means that Nassib will be the starting quarterback for Buffalo in Week 1. Rex Ryan as of now is still the head coach of the New York Jets, and while a divorce appears imminent between the two, he still has some say on personnel and he gets his player, a speed rusher on the outside of the defense. Before the combine, I would have flipped Mingo and Dion Jordan (and believe me if that were still the case I would be shooting off fireworks in celebration) but Mingo has fallen a bit based on questions in production his last season (4.5 sacks in the SEC) and the lack of production against top teams, there is a bust factor written all over Mingo, but he has the upside that the Jets appear to see. He has earned comparisons to DeMarcus Ware and Bruce Irvin, and while I believe the latter is a fairer comparison, it would be a positive if Mingo can reach the productivity of either. The Titans round out the top 10 grabbing a player that many appear to be drooling over, but if teams are as smart as me (and sometimes I tend to wonder if they are not) he will not be drafted any higher than this. He will also not drop past this point at all because he is a number 1 corner in the league right now, but is not the sideline to sideline disruptive corner that many people believe he is. He only registered 6 INTs in 3 years at Alabama, a number that is concerning to many. He also does not bring that added return man element to a team, so he will have to prove his worth as a top corner. The man the Chargers covet falls to them as offensive line is one of the top needs for San Diego, and Lane Johnson fills a need for them. Johnson is an athletic tackle that, in JUCO prior to Oklahoma, played Quarterback and Tight End. The Chargers need to find protection for Philip Rivers because he got smacked around a bit last year, and don’t be surprised if the Chargers take a top guard in the second or third round and come out of this draft with a completely revamped offensive line. The Dolphins have a lot of holes to fill on the line and if they don’t pull off the proposed deal for Brandon Albert, I wouldn’t be shocked if they try to move up a spot or two to secure Lane Johnson to take over for the loss of Jake Long, but if they are stuck here and the board looks the way it does, Warmack has to be the pick. Far and away the best guard available, I wouldn’t be shocked if he went as high as number 7 to Arizona. His size, athleticism, and road-grader mentality is a perfect fit in Miami and he would represent an immediate upgrade over John Jerry on the line. The player that will forever be synonymous with “the trade for Revis” has a lot to live up to, and the Jets especially have to make sure that they are not taking a Vernon Gholston with this pick. They traded arguably the best player in franchise history and one of if not the best cornerback to ever play the game for essentially only this pick (if they let him walk as a free agent when his contract ran out they would have received a 3rd round pick anyway). Tavon Austin is one of those freakish athletes that represent a high risk/high reward as they can be utilized all over the field and with a creative enough OC and a quarterback who is not completely useless (ummmm…). Austin has drawn comparisons to Percy Harvin and I believe that is a very accurate comparison, and I would argue that Austin is more athletic than Harvin. The Jets have many needs and creativity on offense would be one of them. He would immediately help in the return game and would have the potential to make Sanchez look not completely hopeless in what is his last year as a New York Jet. NOTE: The saddest organization in the sport could also consider Geno Smith at this spot. I am writing this pick in here because I believe this will be the spot for Richardson whether or not the Panthers remain here, but I am highlighting this as a potential trade spot. Richardson is a gap rusher who is strong enough to rush through blockers and who has a motor that doesn’t stop. If the Panthers sit here, they will take him, but I am highlighting a potential trade here with the 49ers who also covet Richardson, and if they pull that off, the rich get richer. The best safety in the draft and potential dominant secondary player, the Saints have a lot of holes to fill and could go many different ways, and they will have their choice between Vaccaro and Xavier Rhodes, but in the end I believe the Texas product is who the Saints will select to be their Ed Reed. The Rams are another team that could go in many directions here, and also don’t be surprised if another trade is in the works here or the previous pick, as the Cowboys and Jerry Jones love to move up and maneuver themselves to get the players they want. If the Rams stay put here, I believe they will have their choice between many players, but two that stand out are Ogletree and Jonathan Cooper. Ogletree has to be the pick as the Rams need some depth and added talent at MLB. His DUI shouldn’t scare teams off too much, the kid is a player whose talent will outshine any red flags. When you meet the Georgia Bulldogs, you’re gonna feel the bulldogs bite! We’re going Bulldog-Bulldog in this draft with Jones coming off the board next. It seems like every year the Steelers sit back and take the players that fall in the draft because the teams up at the top don’t understand the draft. Until just leading up to the combine, Jarvis Jones and Star Lotulelei were the top two players in the draft, and people had the Chiefs taking Jones first overall, but after some unimpressive workouts he has fallen. Jones and the Steelers are a match made in heaven and the Steelers get their immediate replacement for James Harrison on their defense, and are better for it. The Cowboys have a few needs that it can take care of in the first round, and as I previously stated, don’t be surprised if they are not picking here and move up to grab someone else, but if they do stay here, Cooper has to be their pick. They need help up front protecting their new $100 million man Tony Romo (pause for chuckles). Cooper is a dominant guard, many people slotting him ahead of Warmack, but I believe this is a good fit for both parties. The Giants have a few needs going into the draft and addressing RT is one of them. Right now David Diehl is their guy, but with injury concerns and inconsistency, they need to address right tackle. D.J. Fluker makes a lot of sense here as he is a road grader and a big body at the position, but he provides little upside. Menelik Watson is one of those players that comes out of nowhere and is drafted high. Watson is from England and was a relative unknown but had a great season and great workouts and I believe slots in as the RT from day 1 with the potential to eventually move over to LT. There is not a lot of football on those knees, meaning he will be able to hold up for a long time. This is the spot where Fluker goes and it is a good spot for him. The Bears need the added protection for Jay Cutler and Fluker can provide that. Big body on the right side of the line, he will be able to neutralize the good pass rushers in the NFC North, but his lack of athleticism can get the best of him at times. Speed rushers are his worst nightmare, so because of this I see potential bust factor here. It is no secret that the Bengals need help in their secondary, and while they really covet Kenny Vaccaro, he will be gone by this point. There are three top safety prospects that deserve mention at the end of the first round: Cyrprien, Eric Reid, and Matt Elam, but I believe Cyprien represents the most upside of the bunch and could potentially be on par with Vaccaro. Coming out of a smaller program, he hasn’t received the notoriety that he deserves, but he has the potential to give offenses a nightmare with his ability to play the pass as well as move up in the box and rush the quarterback and is a fierce tackler. I considered slotting Patterson to the Rams with their first pick in the first round, as they truly need a number 1 wide receiver. They know much like me, though, that this draft is very deep with wide receivers and there is top WR talent reaching into the third round of the draft. The Rams need a pass catcher and Patterson represents a top talent receiver who has the potential to be taken even in the top 10, but I believe that he will fall. Rhodes’ free fall ends here. The Vikings have other more pressing needs to address, but corner is one of them and with the loss of Antoine Winfield, there is an opening on their defense. Rhodes is one of the top CBs available who is tall and able to cover man to man and zone. He should potentially go higher, but if he falls to the Vikings they have to pull the trigger and take him here. The Colts let Dwight Freeney walk this offseason and with him they lost their best edge pass rusher. Freeney wasn’t a typical pass rusher with his hand in the dirt in that he was far smaller than many of his other fellow defensive ends. The Colts have an opening there and Carradine should slot in that opening nicely. Before Carradine tore his ACL at FSU, he was considered one of the top pass rushers available and while that may scare some teams off, the Colts should do their due diligence and realize that he is healthy enough to come in and start. This would have been the Vikings’ first selection two picks ago, but with Rhodes on the board they had to take him knowing that Williams would still be here to take. The Vikings need a defensive tackle to clog the middle of their line and Williams at 6’3” 315 lbs represents a big body in the middle and add to the Williams’ that the Vikings seem to be rotating at DT for the past decade. This pick will be much discussed and I personally don’t think that Lacy may end up being the selection here, much like I don’t believe necessarily that the Packers will be selecting here. If you have been following along, you will notice that Geno Smith is still available and while the Packers don’t represent a destination for him, this is the spot that teams will look to move up into from the second round if they want him. Should the Packers hold on to this pick here, though, there is very little value for their selection here and will draft based on need. What they truly need is a running back and Lacy is one of only about 3 backs in this draft that warrant top consideration. The Texans don’t have many needs as they are a complete team, but wide receiver is a position that they could use additional help with in building for the future. Andre Johnson is a legendary wide receiver, but they could use additional help on the other side of the field to strech the defenses for Matt Schaub. Hopkins is a big speedy target who would give defenses nightmares opposite Johnson and Schaub would be very happy throwing the ball around. Hopkins has a red flag as he was found to be one of the players responsible for trashing his hotel room at the Scouting Combine, but I believe that the team will do their homework and decide it is a non-issue in taking him. The Broncos snafu with Elvis Dumervil really bit them in the behind, and they will pay the price for letting his agent influence the future of their organization in such a direct manner. The Broncos need additional pass rushers to make up for the loss, and Werner represents that type of player. At one point he was in the top 5 discussions but has fallen throughout the process (as I agree with) as I don’t see star written over Werner as some do. He has a great jump off the ball but his strength and pass rush moves leave something to be desired, but he should fit in nicely in the Broncos front seven. The Patriots need help in the secondary as Aqib Talib signed a 1-year deal and Adrian Wilson is turning 34. They don’t have many pressing needs as they are a team built to win now, but corner is a position they could use help with and Trufant represents an upgrade for the future. He has family ties to the NFL and the position (see: Marcus and Isiah Trufant) and will be a great talent. The Falcons are a team that is actually hurting in the secondary, specifically at cornerback with the losses of Dunta Robinson and Brent Grimes. Taylor is a great man-cover corner who has gained a lot of steam over the recent weeks, and could potentially go the previous pick to New England, but if that’s the case, Atlanta will take their pick between Taylor and Trufant. The 49ers don’t have many needs to fill, but they always love stocking up on the front seven, and Datone Jones is a talent that could have an immediate impact on their defense. Justin Smith isn’t getting any younger and Jones could eventually replace him. For some reason, the popular selection is the Ravens shocking the world and taking Manti Te’o with the final selection of the first round on Thursday, and while I believe he would be a good fit on the Ravens defense, they have other pressing needs to take care of. The loss of Ed Reed hurts them tremendously as he was their rock on their secondary, but they can replace him with another Reid (unfortunately not the same spelling). Reid is a big body safety who can fly in the secondary and does not shy away from a big hit. The Ravens defense in the wake of losing Reed and Ray Lewis should want another player who will come in and lay people out. The top offensive lineman available at this point in the process and potential number one overall pick, Joeckel measured in at 6’6″ 306 lbs. Joeckel may go number one overall to the Chiefs, which is fitting since he resembles Andy Reid at 14 years old. Joeckel has been the consensus top lineman prospect all season long and is truly a bookend left tackle prospect for a few months now, as he is very strong in both the run and pass game. I believe he is athletic enough that he will impress the scouts in Indy and not lose any ground as the top lineman available. The top guard at this point in the draft process, Warmack weighed in at 6’2″ 317 lbs, down from the 330 he played at during the season. Warmack has great strength that will be on display at the combine, and while I think that if teams watch his film they will fall in love with him, his on the field workouts will leave much to be desired as his athleticism will not show up in drills. His film speaks for itself, as he has blocked for Mark Ingram, Trent Richardson, and Eddie Lacy, and his skill set will translate to being a top Guard in the NFL. *UPDATE* Turns out Armstead is a workout warrior! The tackle from the little-known Arkansas-Pine Bluff just blazed up faster than Snoop Dogg (or Snoop Lion) with a 4.65 40 time! 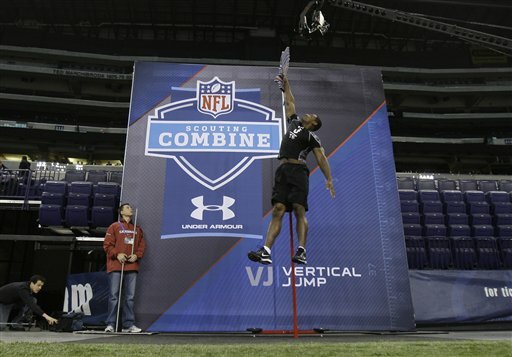 That’s faster than most linebackers from last year’s draft, and Armstead is carrying around a frame of 6’5″ 306 lbs. His knock is that he played for a small school in the SWAC (SWAC, SWAC, SWAC, on you) but this kid is legit. Look for a fast rise up the draft boards after a performance like this! The spot for top tight end available is up for grabs as there are two tight ends equally at the top of the draft that could separate themselves during the combine process. The other star at Notre Dame (who probably did have a real girlfriend), Eifert came into the combine measuring at an impressive 6’5″ 250 lbs and led ND with 50 catches, 685 yards and 4 TDs. He should perform well in the gauntlet challenge which separates the natural pass catchers from the body catchers going over the middle of the field, and has the natural athletic ability to impress the scouts and be the first Tight End off the board in April. Anyone think “Getting Eifed” has a ring to it? Almost identical in size to Eifert at 6’5″ 249 lbs, Ertz has recently been surrounded by top NFL talent (see Luck, DeCastro, Fleener) and has the history of being the top tight end recruit in the nation coming out of high school. Ertz put up huge numbers this past season with 69 catches, 898 yards and 6 TDs, so by the numbers game Ertz wins out, but Stanford ran an offense that went through him as the top offensive target. Ertz will run well, but many of the drills will set him behind Eifert as he won’t run strong routes, wont catch the ball with his hands away from his body, and isn’t the strongest of the two. At the end of the day, Tyler Eifert will be the top tight end available. Gavin Escobar, TE San Diego St. Came into the combine measuring…WHO CARES!? The kid can kick, it don’t matter what his size is! He could be 4 foot nothing for all I care, as long as he can boot the ball the way he has since high school! 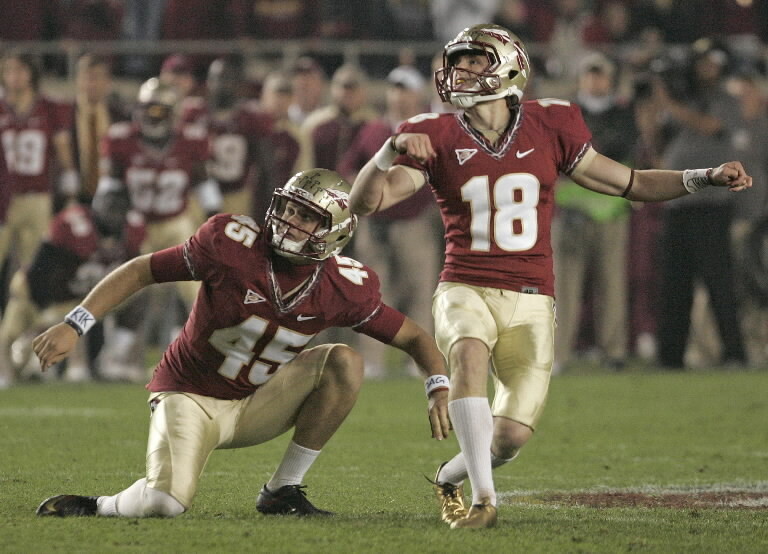 He has only missed one extra point EVER in college (that’s four years, kickers don’t forego their senior years for greener pastures in the NFL) and holds the NCAA FBS Division 1 record for most all-time points by a kicker. He can flat out kick like Bruce Lee. Ever hear that lefty’s do it better? Well look no further than this left-footed booter from deep in the bayou, as Ryan Allen will be a starting NFL punter when next season rolls around (that No. 9 pick is lookin’ mighty tempting Jets fans) as he can absolutely boot the ball. Two-time Ray Guy award winner as the nation’s top punter (first time thats ever happened folks) who will impress in not only distance punting, but placement as well. He led the nation with an average of over 48 yards per punt and looks to continue his impressive run in Indy.